Most horses spend at least part of their time in a stall and there are many reasons for this, the most common being it’s where they sleep. However, horses can also be kept inside stalls because they are on ‘stall rest’ as a result of an injury, they need protection from the hot or cold weather, or they need to avoid injury. There are so many reasons why horses are kept in stalls and there are so many benefits! However, how do you keep your horse safe and content in the stable when he doesn’t want to be there? Here are some of our top tips for stable care for your horse. There are many disadvantages to keeping your horse in a stall, especially for prolonged periods of time. Horses are naturally active animals and they require a lot of exercise. Keeping them closed up in a stall is not always the best solution and can sometimes do more harm than good. While some equine owners may keep their horses in stalls to prevent injury, stall accidents do happen, and horses can easily become tangled in buckets, feeders, door latches, get loose, gorge on stolen feed, and so much more. But how do you prevent these accidents from happening? There are many physical disadvantages of keeping horses in stalls, and keeping them separated from one another can be very stressful. Boredom spells bad news for horses and can lead to bad habits such as wood chewing, cribbing, weaving, stall walking, and bad behaviour when being handled. 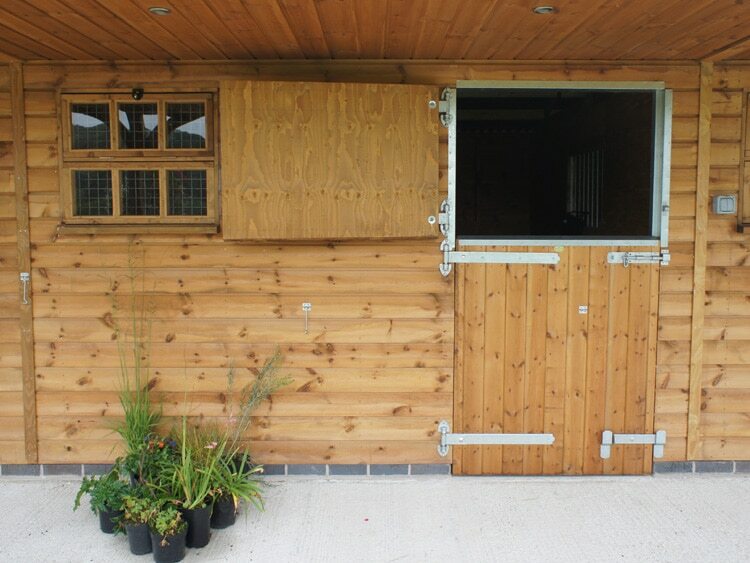 When it comes to horse stabling, your main priority should be the safety and comfort of your horse. If a stable has been poorly designed, it can cause injury or pose a risk to your horse. The stable should be soundly constructed, durable and strong, with no exposed surfaces which could cause injury to you or your horse. All surfaces should also be able to be fully cleaned or disinfected. If the surfaces are treated, non-toxic paints or wood preservers should be used to protect the health of your horse. Fixtures and fittings in the stable can pose a risk of injury or accident. Therefore, fixtures and fittings such as hay racks, tie rings, water bowls, and so forth, should be free of sharp edges and positioned in such a way that avoids injury – particularly to the horse’s eyes. A good way to ensure the safety of your horse is by removing head collars. This ensures that, if absolutely necessary, your horse should be capable of breaking free under pressure to avoid injury or prevent entanglement. Ensuring you remove head collars when stabling your horse helps avoid the risk of the horse getting injured. Prioritising sufficient light in the stables is essential for your horse to see adequately and also allow for safe inspection and handling of horses at all times. Whether you light your stable by natural means or through the inclusion of portable lighting. However, if you do use portable lighting, be sure all light bulbs, fittings, and cables are well out of reach from your horse. Horses vary in size and it can be difficult to find the ideal size stable for your horse. However, as a minimum, we would recommend your horse has enough space to lie down, and easily stand up and turn around in comfort. If you would like to know the stable and size we would recommend for your horse, please do not hesitate to call our team at Prime Stables Ltd today for more information. Providing suitable bedding for your horse is extremely important to ensure your horse is protected, warm, and able to lie down and rest in comfort. Whatever bedding you use, whether straw or rubber matting, it should be well-managed and regularly cleaned. Fire is always a risk in horse stables and it is extremely important you seek advice from local Fire Prevention Office to ensure the safety of your horse(s). Highly flammable liquids should not be kept in or close to stables where horses are being kept and smoking in stable areas should always be prohibited. You must ensure all equipment and services (for example, lighting units, alarm systems, and fire extinguishers) should be inspected annually by a qualified professional and kept in good working order to ensure your horses are kept safe. All wiring and fittings should be completely inaccessible to horses, safeguarded from rodents, and well-insulated to ensure your horses are kept safe. This will reduce the risk of injury to your horse. In the ideal scenario, your horse will live outdoors 24/7. However, unfortunately this is not always possible and for one reason or another, your horse requires a lot of time in the stall. So, in these cases turn-out time is incredibly important and also keeping your horse’s indoor environment safe, secure, well-maintained, and healthy. A healthy stable environment means a happy and healthy horse.